The SoundIn object is used to record vocal responses in from the subject within E-Prime. Vocal responses are recorded in WAV format. A new SoundIn object may be added by clicking the SoundIn object icon in the Toolbox, and dragging the object to the Workspace or to a procedural timeline in the Structure view. For existing SoundIn objects, clicking the object once with the mouse in the Structure view to select it will result in the display of that object’s properties in the Properties window. The SoundIn object does not have an interface through which properties are set. Dragging the SoundIn object icon to the Workspace, or double clicking a SoundIn object in the Structure view will open the object’s Property Pages, through which the properties for the Soundin object may be set. The name of file used to save the audio captured by the SoundIn object may be indicated directly in the SoundIn properties, or the bracket/attribute notation may be used to vary the name of the file used. The default value is "@AUTO" which is a special value for this field that instructs E-Prime to automatically generate a unique filename for each successful run of a sound capture object. The automatically generated filename is in the format of Experiment Name-Subject Number-Session Number-Object Name-File Number.wav. So, for example, a SoundIn object named "SoundIn1" in an experiment named "Stroop" with a subject number of 5 and a session number of 1 would generate the following filenames: Stroop-5-1-SoundIn1-1.wav, Stroop-5-1-SoundIn1-2.wav, etc. The properties for the SoundIn may be set using the Property pages. The Property pages may be displayed by double-clicking the SoundIn object in the Structure view, or by clicking the ellipsis (…) in the Property Pages field in the Properties window. The Property pages open by default to display the General tab. The General tab allows the specification of the filename to be used for the audio captured, as well as the action that should be taken when sound capture has ended. CaptureFilename @AUTO, Strings, Attribute references Specifies the name of the file that should be used for saving the recorded audio. Specifying "@AUTO" will cause E-Prime to automatically generate a filename unique to each successful sound capture. BufferSize Integer values Specifies the maximum length of audio to be recorded. StopAfter Yes, No, Attribute references Indicates whether sound capture should end when the object stops executing (e.g. the time specified in the Duration property has elapsed). 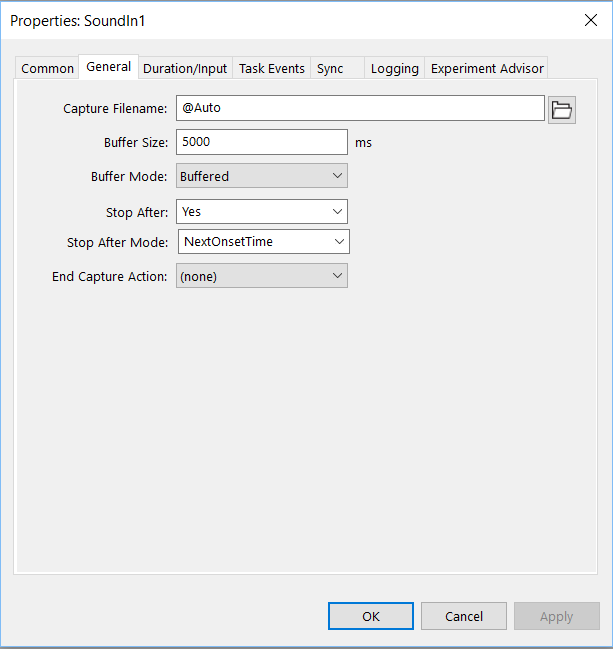 StopAfterMode NextOffsetTime, OffsetTime Indicates whether sound capture should end when the object stops executing (e.g. the time specified in the Duration property has elapsed). EndCaptureAction (none), Terminate, Jump Specifies the action to be taken when capturing terminates. The Properties of the SoundIn object may be set using the fields in the Properties window. Properties to be set include the duration of the SoundIn, whether input is allowed, and the termination conditions for the playback of the SoundIn. (Name) String values Assigns a user-entered string as the name of the SoundIn object. (About) ---------- Displays the About SoundIn dialog. DataLogging None, Standard, Response Only, Time Audit Only, Custom Determines the category of variables logged for the object. Duration -1 (infinite), Numeric values (default in ms), Attribute references Determines the duration of the object in milliseconds. EndSoundCaptureAction (none), Terminate, Jump Determines if the currently running object should terminate, jump, or do nothing once the fixed buffer has been filled. Filename String values (e.g. Movie. mpg), Attribute references Designates the name of the file to load for display. GeneratePostRun Inherit, EndOfProcedure, AfterObjectRun Where the postrun part of this object is generated in the script. GeneratePreRun Inherit, TopOfProcedure, BeforeObjectRun Where the prerun part of this object is generated in the script. HandlesConditionalExit Yes, No Determines whether or not the E-Object responds to the conditional exit event. JumpLabel String values, Attribute references Identifies a Label object within the current Procedure to which program execution jumps when input is received on an input mask that has an End Action of "Jump". LoadTimeStatsEnabled Yes, No Determines if the LoadTime stats will be included in the Experiment Advisor report. Notes String values User-entered text useful for storing information or comments related to an object. OffsetSync (none), Vertical Blank Sets the object or event with which the offset of the object is synchronized. OnsetSync (none), Vertical Blank Sets the object or event with which the onset of the object is synchronized. OnsetDelayStatsEnabled Yes, No Determines if the OnsetDelay stats will be included in the ExperimentAdvisor experiment report. Pan Numeric values, Attribute references. Specifies the pan level in 100th decibels. Functionality dependent on the PanControl property setting. PreRelease Numeric values (default in msec), Attribute references. Amount of time released during the processing of the current object to allow for setup of the next object. 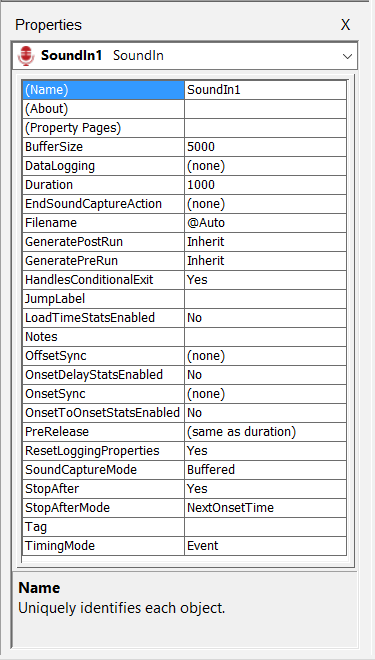 ResetLoggingProperties Yes, No Determines if the logging properties should be reset at the top of the procedure. StopAfterMode NextOnsetTime, Offset Time Determines when the sound capture stops. Tag String values, Attribute references. Defines a string value to be logged with the object. Timing Mode Event, Cumulative, Custom Determines whether timing occurs in Event, Cumulative, or Custom mode.